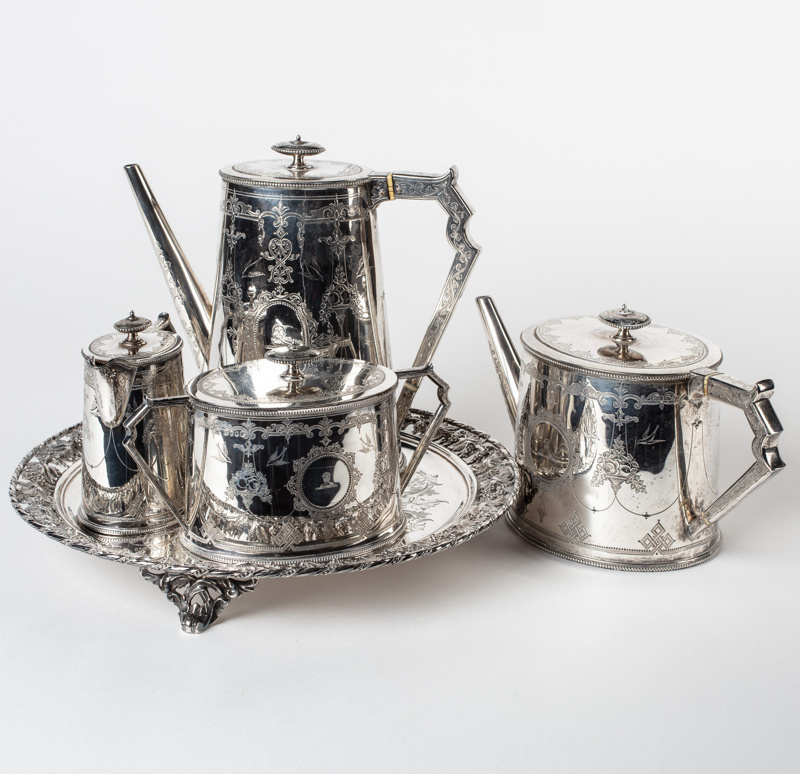 This sterling silver tea and coffee service, comprising, a teapot, coffee pot, sugar bowl and cream jug, together with an engraved salver, were presented to Dr J A R Menzies in 1875. 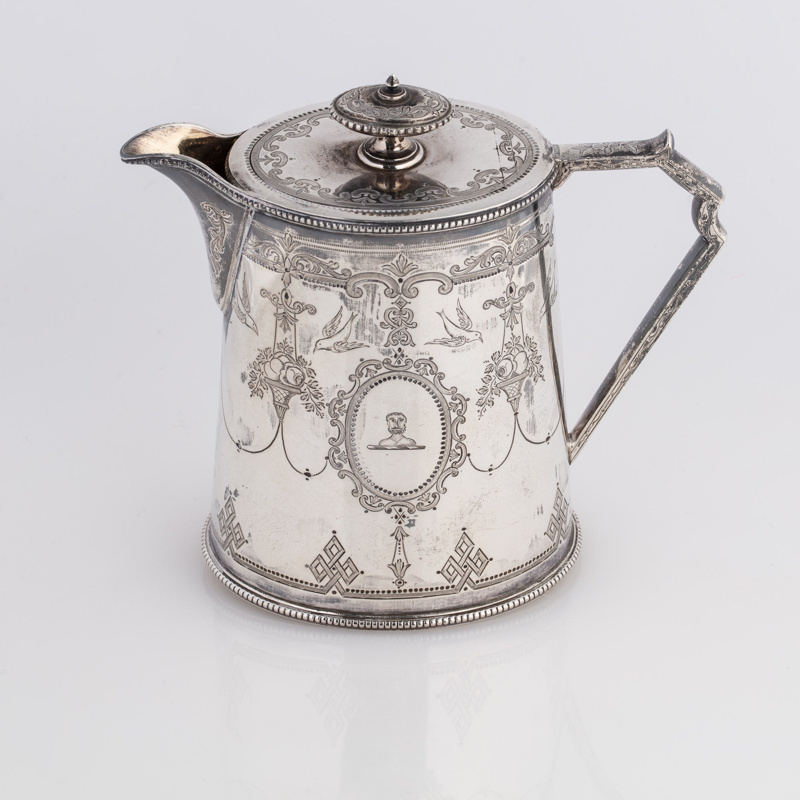 All pieces bear hallmarks for 1872 or 1875 and the maker's mark of Martin, Hall & Co, the renowned silversmiths of Sheffield, England. 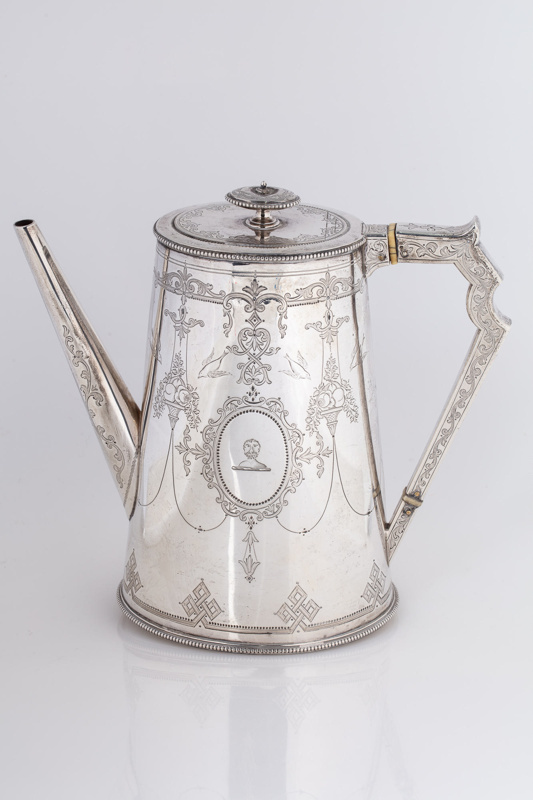 The items are also engraved with Menzies' personal monogram and crest. 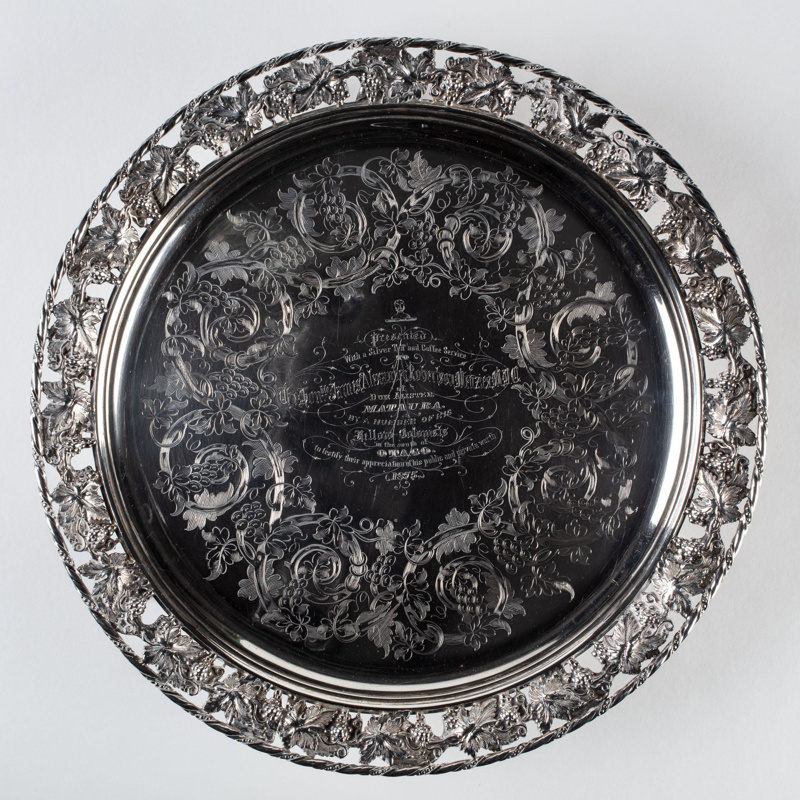 The heavy Salver, with repoussé grapevines around a pierced border, sits on three short claw feet and is engraved with details of the Presentation. The raised tea and coffee pots have applied cast spouts and handles with protective ivory strips laid in for heat protection. 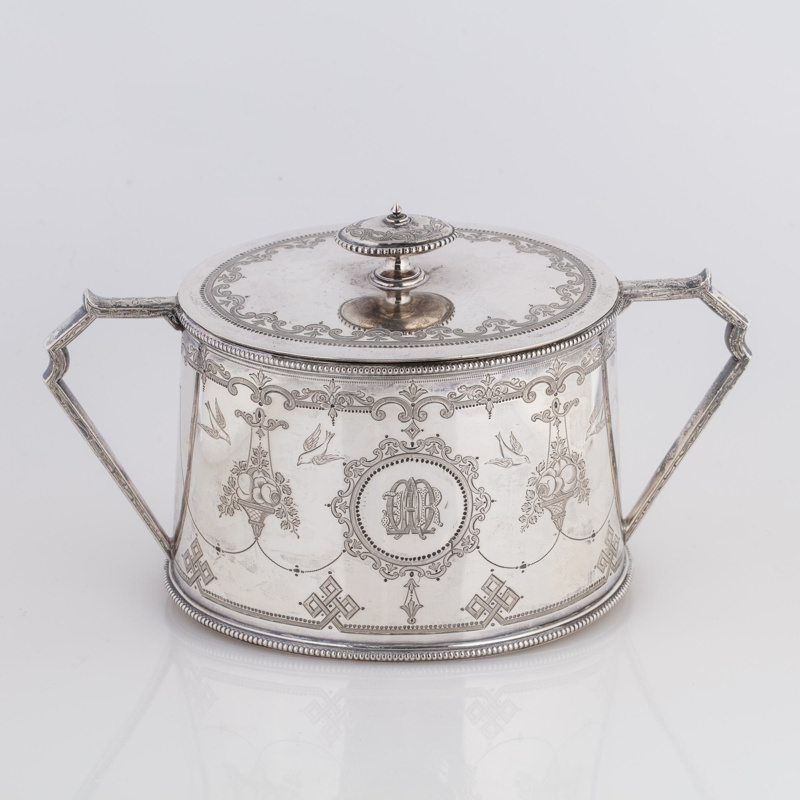 The sugar bowl and cream jug are also lidded, which is very rare, and all four items have ovaloid bodies, with slightly conical form and parcel-gilt lining. All show crisp, bright cut, engraved decoration with floral swags and swallows, and beaded borders. The presentation and significance of these items was recorded in The Southland Times, 29 Nov 1875, where a large gathering took place in the crowded Club Hotel (Gore?). MP Alexander McNab of Knapdale gave the address and formally presented Menzies with the silverware, " ... as a token of ... appreciation for his political service to Southland and as a testament to his personal character." In return, Menzies gave a speech reflecting on his political career, his life in Southland and his appreciation of the people who had presented him with, "such a magnificent and valuable gift". Dr James Alexander Robertson Menzies M.L.C was born in Perthshire, Scotland. The son of a doctor, he trained at the Royal College of Surgeons, Edinburgh. In 1853, he decided to migrate to New Zealand, changing profession to become a farmer. He was the first settler to purchase a block in the Wyndham area (38,000 acres) after Commissioner Mantell purchased the southern region of New Zealand from local Māori at Bluff. Named Dunalister, for his home in Scotland, Menzies' block was in the hinterland with neither roads nor railways to provide access to the port at Bluff. Menzies felt that the Otago Provincial Council was neglecting those in the south with their public works programme, and in 1857 he mounted a petition for the formation of a new province, to be called Murihiku. On April 1 1861, the Province of Southland was voted into existence. Menzies became the first Superintendent of Southland, and in this capacity he immediately began to develop a railway network. Menzies was Superintendent until 1865 and continued to serve on the Southland Provincial Council until 1869. Southland re-joined Otago in 1869, however, Menzies continued to faithfully promote the interests of Southland in the Legislative Council until his death in 1888. In Invercargill, where he later resided, he was either president or a member of almost every public institution including the Caledonian Society, Bluff Harbour Board, Southland Education Board and the Invercargill Savings Bank. Although Menzies did not practise medicine in New Zealand he always responded to a call in an emergency and it is this consideration and care of people on a personal level which meant that, though at times his political life was turbulent, he was always held in high regard. 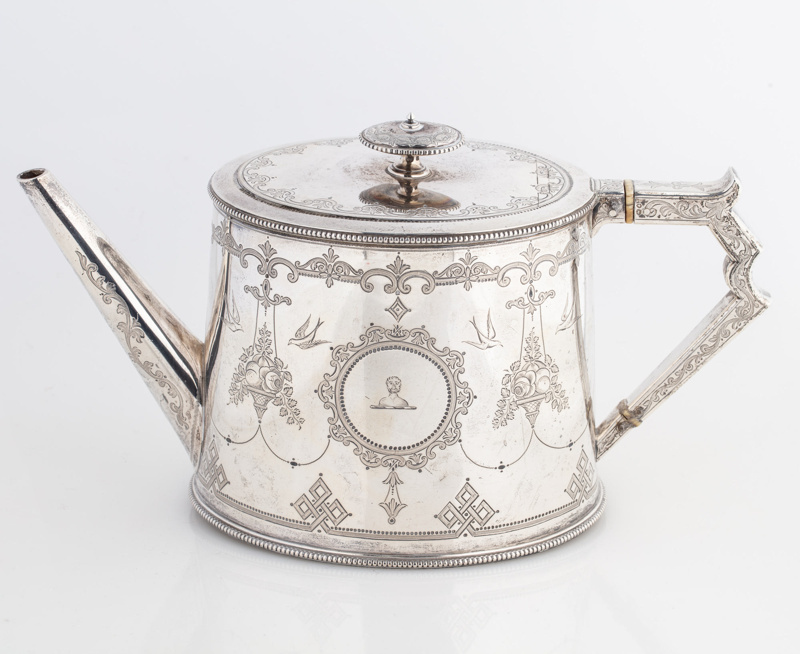 Martin, Hall & Co were originally based in Sheffield but went on to manufacture in London and Birmingham. Please see Parts for maker's mark, city of manufacture, duty & date. All items bear the crest of Dr J A R Menzies, along with his monogrammed initials.